I was just a kid in 1986 and space travel and astronauts was very exciting. I remember watching the Challenger exploding and my young eyes not really believing what I was seeing. Then the leader of our nation got on television and put into words what a young heart couldn’t speak at the time. Just 650 words, delivered in under 5 minutes comforted me and a grieving nation. I consider myself lucky that the first President that I knew was Ronald Reagan…it is a pity that those who have followed him have been found wanting. 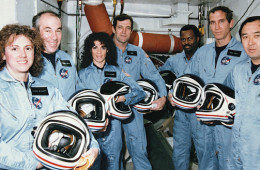 The following article is from Savingourfuture.com and goes into greater detail about the Challenger crash and the man who soothed a nations grief. Twenty-nine years ago today, January 28, 1986, the NASA Space Shuttle orbiter Challenger exploded and broke apart 73 seconds into its flight, leading to the deaths of its seven crew members including the first teacher in space, Christa McAuliffe. Space Shuttle flights began to seem routine by 1986, but the addition of a teacher heightened interest in this launch. Schools had assemblies, offices turned on their TVs etc., all to celebrate the launch. The celebration lasted only a minute and 13 seconds. It was one of those times when the entire country grieved. It was more than just failure of a dangerous mission, more than the public death’s of seven brave heroes, it was a blow the collective psyche of this nation. Until then, at least in our own minds, the space program was perfect and a source of pride for all Americans. The Apollo 1 accident, which happened 48 years ago yesterday, killed Gus Grissom, Ed White, and Roger Chaffee who were just as brave and heroic, and their deaths were just as tragic, but it didn’t happen on live TV. That night, after the video of the exploding spacecraft was played over and over on the TV and in our minds, the President spoke. In an address of 650 words delivered in less than five minutes, President Reagan comforted the collectively bereaved American people. He mourned the loss of the Astronauts, explained the tragedy to our kids, and lifted our spirits. He showed himself to be the kind of leader this country could use today. I think about what our current President would have to say about a similar tragedy if it were to happen today. If they could get him off of a golf course in order to comment on it I have a feeling he would go on about how the real tragedy is that there aren’t enough black astronauts, or that he is launching program to send children of illegal immigrants to Space Camp. Heaven forbid Obama’s telprompter goes down…instead of the five minutes of heartfelt eloquence got from Reagan, we’d instead be “treated” to five minutes of bumbling and rambling nonsense. Yeah…he’s a real eleoquent speaker. In truth he’s a professional public reader. I think if i was a child and I had to listen to him try and comfort a nation after a tragedy, I’d have nightmares for months. Heck, I think most of America has had nightmares for about 7 years now.